Stephanie Aviles was born in downtown Los Angeles in 1996. She has been raised in a house in Pasadena with her older brother, father, mother and grandmother. When Stephanie was 7 she took an interest in music and acting. Acting at home with cousins and singing modern and oldies music was her daily fun. Although she never acted or sang in front of people, it was more like a fun thing to do on the side. Stephanie took another interest when she was about 10 years old. Her brother had many race car photographs in his room and she would sit back and stare at the photographs trying o visualize how she would draw it on a blank paper. Once she had an idea how to start then she would draw. At first the drawing didn’t come out as she wished. Nevertheless, as time went by, she started drawing more stuff other than cars, people, animals insects, flowers etc. It really has improved tremendously. Drawing and painting has become a passion for Stephanie. 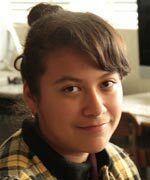 Nevertheless, now being in high school at John Muir, Stephanie has also become interested in film. Film takes Stephanie to another world, another universe, taking her to many journeys, whether the journey is sad, happy, lonely. Nevertheless film had been a great thought in her mind and as well the beautiful, delightful interest of music has come back over these past 3 years. Stephanie wishes and hopes for a career in the entertainment business. She would like to start off as a performer, a singer. Then move onto acting and also make beautiful paintings and drawings for the world to see. She also wants to make films of her own, directing a film one day. She thinks it would be marvelous to do so. This project, “GO PUBLIC” is not only a great opportunity, but a challenge to expand and gain knowledge about the film industry and to acquire skills valuable for any industry. She would like to say that this opportunity is a great experience to open up many minds and to open eyes that have been sealed. Being part of making this film has been a delight. It will show the public and the world about PUSD and what is needed to provide students with an education. Stephanie would like to say thank you to the creators of “GO PUBLIC: A Day in a Life of PUSD” for making this film become a reality and for letting her be part of this experience.